HYDERABAD: In a move to enhance last-mile connectivity, the Hyderabad Metro Rail Limited (HMRL), on Wednesday, inaugurated three new bike stations at Nagole, Parade Ground and Begumpet stations. Commuters alighting at any of these points can now rent a bike for a meagre Rs 4 per kilometre to travel to and from their destinations. Earlier this year, the first such ‘Rent a Bike’ station was set up at Miyapur — a collaborative venture of HMRL and a private agency — with 20 bikes available for hire. With three new stations being added to the list, the total count of bikes across stations has now touched 60. N V S Reddy, managing director, HMRL said tha t the project will gradually be scaled up to include 500 bikes. “The rent a bike project has seen good demand among commuters. It will slowly be scaled up and extended to all Metro stations,” said Reddy. Passengers can rent these bikes by furnishing driver’s license and Aadhaar card and will have the option of renting vehicles with or without gears to reach their workplaces/houses from the stations. Commuters will not have to pay any waiting and fuel charges. According to those working with Metro Bikes, the bike rental agency providing the service at the Metro stations, helmets will also be provided to commuters availing the service. 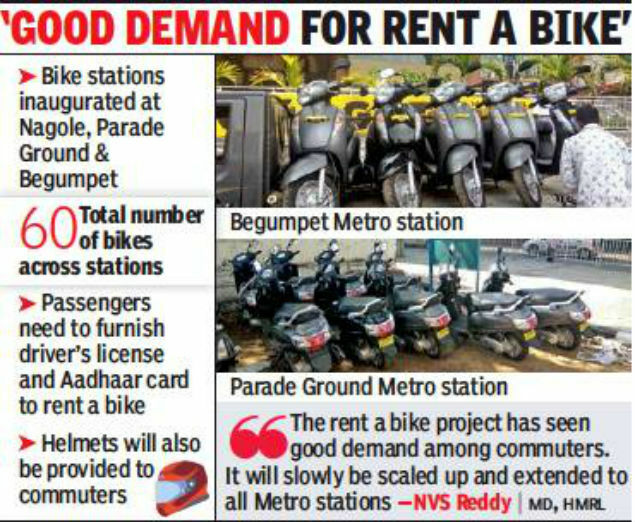 “Now rent a scooter starting at Rs 4 per kilometre at Nagole, Parade Ground, Begumpet and Miyapur; service provided by Metro Bikes,” tweeted L&T Metro Rail (Hyderabad) Limited officials, on Wednesday.